Please join us for our next meeting on Tuesday, January 15th at 7pm at Rideau Park United Church. We will have updates from our planning and parks committees and for our city Councillor. We will also be discussing potential future use of the fieldhouse located on Randall Avenue. Hope to see you there. Please join us on Tuesday, November 20th at Rideau Park United Church for our Alta Vista Community Association (AVCA) Meeting. We will have an update from our councilor, Jean Cloutier, as well as a presentation on the Neighbourhood Watch program. There will also be a discussion on priority setting for the AVCA for the upcoming year- please join us and help shape the future of the association. The meeting starts at 7pm, and all are welcome and encouraged to attend. 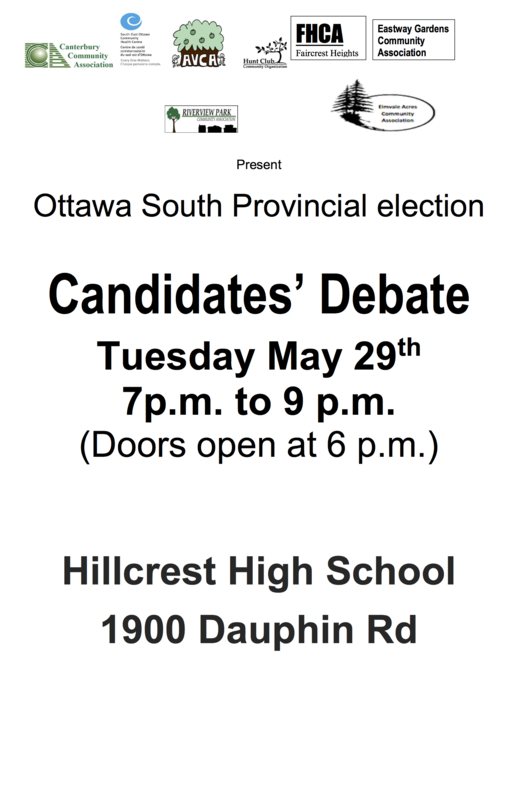 The Ottawa South provincial debate will be held tomorrow (Tuesday May 29th) at Hillcrest High School. Doors open at 6pm, debate starts at 7pm with moderator CBC’s Joanne Chianello. This event is presented in part by the AVCA and our partner community associations and organisations in Ottawa South. Please feel free to share this message with your neighbours.